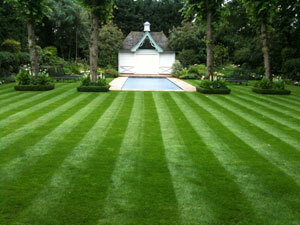 George Davies Turf is a specialist supplier of fresh, high quality turf in Milton Keynes. Our team delivers your turf exactly where you want it, when you want it. The majority of our deliveries involve cutting the turf in the morning and delivering it in its peak condition in the afternoon. Our on-site facilities mean we can keep turf at its optimum temperature, even in the summer months when temperatures can rise above 30°C. Our variety of products mean we’ve been able to cater for a wide range of landscaping projects, and since our company began in 2001 we’ve become a leading supplier to golf courses, homeowners, local authorities, builders, developers, landscapers and architects. To meet demands all year round, our team make the process of delivering turf in Milton Keynes simple, we have a fleet of lorries with special equipment enabling us to place the turf in all kinds of nooks and crannies, while our lorries can carry up to 960 metres squared of turf. Our experienced team will always help our customers choose the right turf in Milton Keynes for their needs, but all of our customers can be rest assured that they are getting high quality products, sourced from one of the UK’s leading growers, County Turf. Greenscape is an extremely popular product we supply and it can be a perfect grade for family lawns, golf courses and amenity landscaping, while it’s also a lawn that will hold its green colour all year round. For a turf that requires less maintenance, County Shades is a popular option. It’s designed to thrive in the shade while it requires 50% less mowing than a typical rye lawn. RTF (Rhizomatous Tall Fescue) is a relatively new turf and it’s not just extremely drought tolerant, it can also handle being waterlogged, while it offers excellent surface strength and traction, making it a good choice for walkways, racecourses and football pitches. An extremely fine-textured turf we supply is County Greens, but it’s specifically designed for golf greens and bowling greens while it’s close to USGA specification. George Davies Turf is also renowned for delivering topsoil in Milton Keynes, which can be purchased in one tonne bags. Placing your order of turf in Milton Keynes with a member of our team is simple, and the most appropriate way to do this is to call one of the team on 01234 714555 or 01727 821 765. To find out more about our products and services call today, or alternatively you can email us at info@georgedaviesturf.co.uk and a member of staff will get back to you as soon as possible.